Radiation oncology is the medical specialty focused on the use of radiation therapy (also known as “radiotherapy”) to treat cancer. A physician who specializes in this area of medicine is known as a radiation oncologist. All radiation oncologists at MCA are certified by the American Board of Radiology and possess a wealth of training and experience, with expert knowledge of innovative treatment methods. They meet regularly to discuss individual patient cases and review treatment options to ensure that each patient is given the best possible chance of a successful outcome. Once a course of treatment has been decided upon, the MCA radiation therapy team uses state-of-the-art technology to design and deliver an optimal treatment plan tailored to your specific condition. You can be confident that our nationally recognized radiation oncology department will provide you with the highest standards of care. A team approach is utilized from the consult, simulation, treatment planning, treatment delivery, quality assurance, and follow-up care that you will receive. Members of the team include: Radiation Oncologists, Nurses, Radiation Therapists, PET Techs, CT Techs, Dosimetrists, and Physicists may all participate in your care. Often your Medical Oncologist, Surgeon, Urologist, Dentist, Dietitian, Social Worker, and others will collaborate in your overall treatment approach. 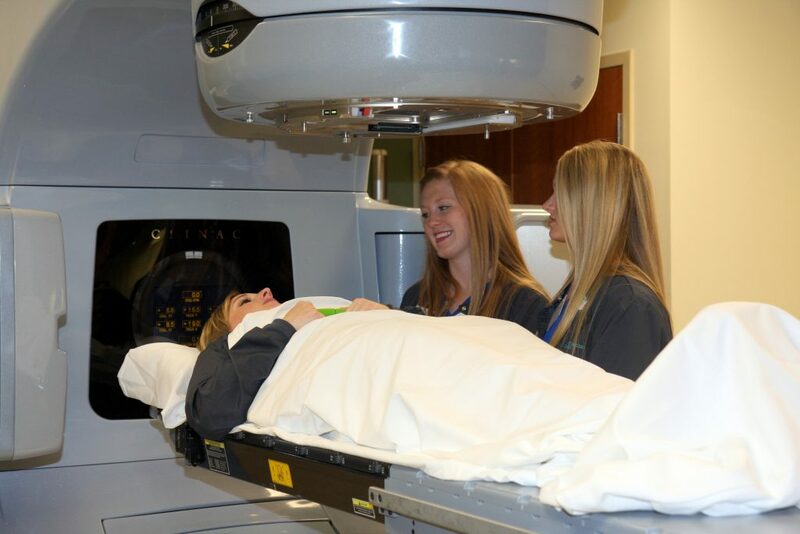 Missouri Cancer Associates is honored to hold the Radiation Oncology Practice Accreditation (ROPA) from the American College of Radiology (ACR). Learn more about this accreditation. Image Guided Radiation Therapy (IGRT): A procedure that utilizes imaging capabilities right before the treatment beam is activated giving us the highest accuracy for targeting and thereby allowing us to use very tight/conformal fields helping to minimize normal tissue reactions. IGRT is not a treatment but it helps guide treatment. Options include 3D setups utilizing orthogonal x-rays and/or a single slice CT scan can be performed while on the treatment table. 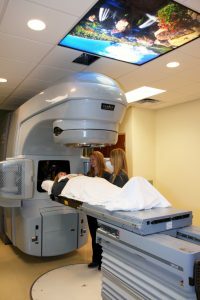 Intensity Modulated Radiation Therapy (IMRT): This therapy uses sophisticated software and hardware to perform to deliver high doses of radiation to a tumor by approaching it from many different angles or even in continuous arcs, while minimizing the amount of radiation to normal, surrounding tissues. The higher dose to the tumor can result in a higher possibility of cure, and the lower dose to surrounding tissue results in fewer side effects. Volumetric Modulated Arc Therapy (VMAT) or Rapid Arc®: (VMAT) or RapidArc® is an advanced form of IMRT that delivers a precisely-sculpted 3D dose distribution with a 360-degree rotation of the gantry in a multi-arc treatment. Unlike conventional IMRT treatments, during which the machine must rotate several times around the patient or make repeated stops and starts to treat the tumor from a number of different angles, VMAT / RapidArc® can deliver the dose to the entire tumor in a 360-degree rotation. RapidArc® uses special software and an advanced linear accelerator from Varian to deliver IMRT treatments up to eight times faster than what was previously possible. Volumetric modulated arc therapy delivers dose to the whole volume, rather than slice by slice. Stereotactic Body Radiation Therapy (SBRT): This therapy is a type of IMRT that utilizes more precise positioning and precisely delivers very high focal doses of radiation to tumors in the body (except the brain) given over 3-5 days instead of 6-8 weeks. Four-dimensional computed tomography (4DCT) gating is also utilized during our simulation for SBRT planning. For some patients, SBRT may be able to replace surgery as a primary cancer treatment. SBRT is typically used to treat a small, early-stage non-small cell lung tumor, yet can also be considered for metastatic tumors in the lung, liver, spine and adrenal glands. High Dose Rate Brachytherapy (HDR): This therapy uses a radioactive source that is temporarily placed inside body in close proximity to the disease site. Then, a high dose of radiation is given to a limited area, sparing the surrounding normal tissue. HDR brachytherapy lasts only a few minutes in the outpatient setting and causes little discomfort, fewer complications, and a more rapid recovery time. Radiopharmaceutical therapy: Entails the injection of a medication that contains radioactive atoms. For example, a radioactive form of iodine (I-131) may be used for the treatment of thyroid cancer. After entering the bloodstream, iodine is preferentially taken up by the thyroid, where it remains temporarily concentrated and releases its radiation into the surrounding tissue. Another example of a radiopharmaceutical is Xofigo (radium-223 dichloride). Xofigo is indicated for the treatment of patients with castration-resistant prostate cancer, symptomatic bone metastases, and no known visceral metastatic disease. This treatment option may be used when your cancer is resistant to medical or surgical treatment, and/or if the cancer has spread to your bones but not to other parts of the body.